This morning I'm waking up on the living room couch where I have been sleeping for about a week...*sigh*...how many times has this happened over the last 8 years I ask myself? I'm sleeping here because it's easier access to the bathroom and kitchen than my bedroom. The weakness, shaking, pain, burning, heart attack symptoms, difficulty breathing, body going numb/vibrating makes mobility quite difficult and painful....so on weeks like this...I spend my days/nights in the most easily accessible to the most important areas of the house by sleeping/resting on the couch in the living room. To be honest, most of the time I'm okay with it...yes, I'm fighting....yes, I can't wait til I'm better...yes, it's still hard....but *most* of the time I'm so blessed by seeing beauty in the pain that the fight is okay...HIS grace is SO evident and felt SO deeply that how can I not but PRAISE Him and be excited about each new day. But that is *most* of the time...not *ALL* the time. And this past week, unfortunately has been the latter of those two. <3 The pain...the Lyme attacks...the treatments...figuring out medical finances...being too exhausted to even get dressed...everything has just compiled and I've lost it so much this past week in tears. I've been feeling pretty discouraged and it's been really hard to say the least. I was really hopeful and thinking that by September I would be all better...and then here comes yet another set back....:-/ I just want to be "normal" again...and have these set-backs end. ANYWAYS, all that to say when I woke up this morning and began my devotions my heart was crying out for some HOPE from my Jesus. Hope that this debilitating physical pain won't last forever...HOPE that not all the dreams I have for my life will be crushed...HOPE that someday I'll wake up with energy and be pain-free again...HOPE that just walking and carrying on a conversation with someone won't be such difficult tasks. And...as always, it NEVER ceases to amaze me how Jesus always sends us to EXACTLY what we need...how does He orchestrate our Bible reading and Devotional reading so precisely as to have us read the perfect verses and be reminded of the most appropriate promises at just the right time? He is so precious and I'm so blessed beyond what I deserve to have HIM. <3 The following were from my reading this morning that really encouraged me and filled me with HOPE. <3 Thank You, Jesus. 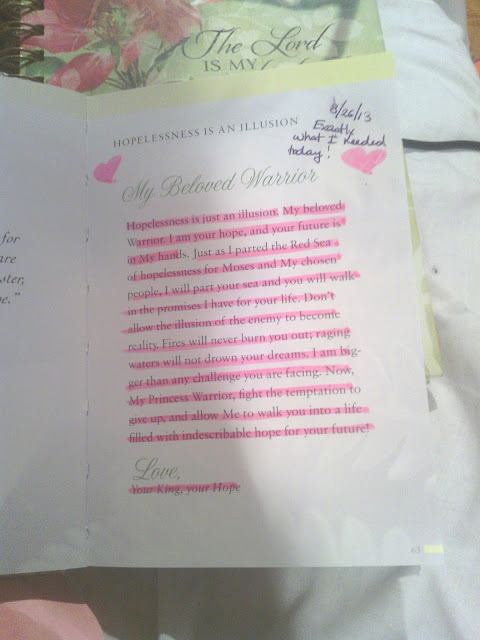 Hopelessness is just an illusion, My Beloved Warrior. I AM YOUR HOPE, and your future is in My hands. Just as I parted the Red Sea of hopelessness for Moses and My chosen people, I will part your sea and you will walk in the promises I have for your life. Don't allow the illusion of the enemy to become reality. Fires will never burn you out; raging waters will not drown your dreams. I am bigger than any challenge you are facing. Now, My Princess Warrior, fight the temptation to give up, and allow Me to walk you into a life filled with indescribable hope for your future."